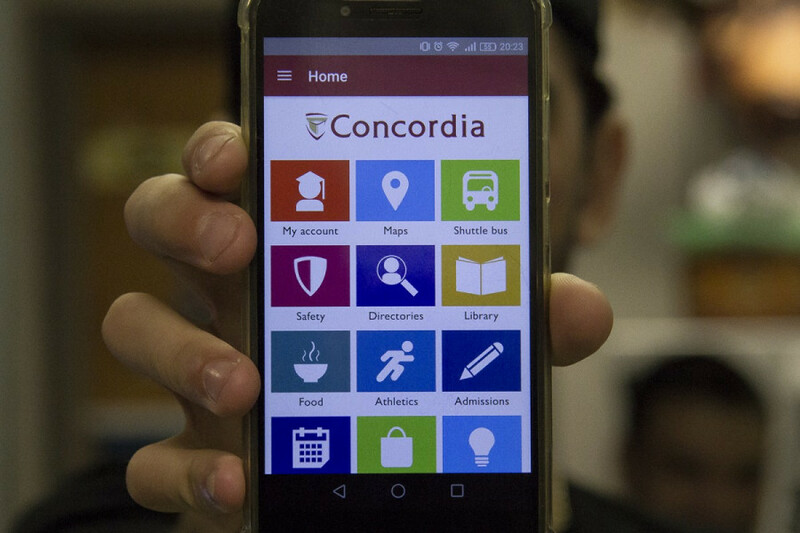 The much anticipated first phase of the Concordia Mobile app was released at the beginning of this semester, inciting a tsunami of mixed reactions from students. A post on Spotted:Concordia, published on Sept. 5, which received 122 likes, triggered an explosion of comments, feedback and premature confusion over the application. “$27 million down the drain. Another crap project authorized again….” said one commenter on the post. “Using the money they ripped off from me as ‘tuition,’ that’s what they made,” said another. According to Barr, the application was developed by a team whose members include Concordia University Communications Services, and Instructional and Information Technology Services. Barr said there was a consultation phase between January and June to identify the information that should be included in the app. An analysis was also made of similar apps available to students at other universities, and they took into account the services that were most used by students. The app is intended to improve the student experience at Concordia, she said. “We intend to continually develop it to provide students with immediate access to information they need,” said Barr. The app offers students several services and links from the Concordia website and Moodle in an easy to use format. It has received both positive and negative reviews from the student body. The app has an average rating of 3.9 stars on the Google Play Store. “Good app, fast, and reliable,” posted Ibrahim Jammal on the Google Play Store. Students can access some aspects of their student account through the app, such as their schedule, grades and class cancellations. “It’s missing out on features. A pretty important one for me, and I’m sure a lot of other people too, is the ability to view your weekly schedule in a timetable. Instead, the app just lists out all your classes which isn’t very pleasing to look at,” said third-year software engineering student Ethan Tran. “It’s missing out on features. A pretty important one for me, and I’m sure a lot of other people too, is the ability to view your weekly schedule in a timetable. Instead, the app just lists out all your classes which isn’t very pleasing to look at.” —Ethan Tran. The app also provides multiple maps, including maps of both the Sir George Williams and Loyola campuses, bike racks on campus and parking. An updated shuttle bus schedule is posted along with a live shuttle bus tracker. “The shuttle tracker is a life-changing experience. Forget the rest, that’s all you need in your life,” said Nia Krasteva in a review of the application on Google Play Store. The app contains a safety feature that links students to emergency services, as well as student guides, such as back to school guidelines, academics, money, and where to eat around campus. “It looks like Concordia made an app version of its webpage. I’d appreciate a mobile friendly version of the Student Information Services site a lot more,” fifth-year software engineering student Ronnie Pang said. Students can also find links to library services, an academic calendar, and information about the Concordia Stingers athletics teams. The Concordia mobile app is currently available for download on the Google Play Store, as well as on the iTunes app store. To help with the development of phase two of the app, submit your feedback through the app itself or the Concordia website.